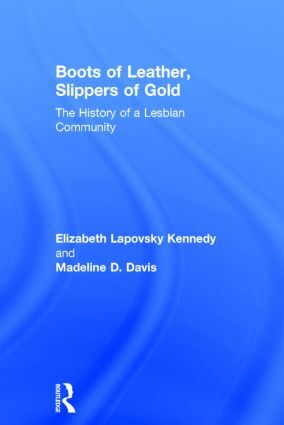 Boots of Leather, Slippers of Gold traces the evolution of the lesbian community in Buffalo, New York from the mid-1930s up to the early 1960s. Drawing upon the oral histories of 45 women, it is the first comprehensive history of a working-class lesbian community. These poignant and complex stories show how black and white working-class lesbians, although living under oppressive circumstances, nevertheless became powerful agents of historical change. Kennedy and Davis provide a unique insider's perspective on butch-fem culture and argue that the roots of gay and lesbian liberation are found specifically in the determined resistance of working-class lesbians. This 20th anniversary edition republishes the book for a new generation of readers. It includes a new preface in which the authors reflect on where the last 20 years have taken them. For anyone interested in lesbian life during the 1940s and 1950s, or in the dynamics of butch-fem culture, this study remains the one that set the highest standard for all oral histories and ethnographies of lesbian communities anywhere. I cherish Boots of Leather, Slippers of Gold for teaching me about butch-femme cultures I never knew existed and inspiring me to practice oral history and ethnography as queer research method. An instant lesbian and queer classic when it was published, twenty years later it has become a vital document of the 1990s butch-femme revivals that gave rise to queer theory and new forms of gender. And it remains invaluable as a model for radical research practices that document local and ordinary lives. A bold, tender, and timely exploration of working class lesbians, Boots of Leather, Slippers of Gold is classic queer oral history that continues to inspire. Through the memories shared by butches and femmes from varied racial and ethnic backgrounds who lived and loved pre- and post-World War II, we learn lessons of individual courage and celebrate collective resistance. Elizabeth Lapovsky Kennedy is Professor Emeritus of Gender and of Women's Studies and English at the University of Arizona, and a pioneer in the field of lesbian history. Madeline D. Davis is a noted gay rights activist and the founder of the Madeline Davis Gay, Lesbian, Bisexual, and Transgender Archives of Western New York.